Benjamin and Theresa LeBlanc, and Albert and Louise LeBlanc, deeded the Candlebox for $125.00 to the crown in 1891. 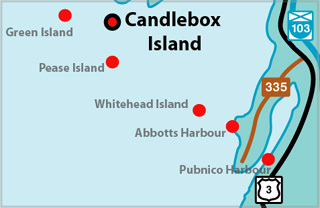 The first lighthouse was a tapered square wood tower with attached dwelling, painted white. The 56 ft. high tower had a fixed, red, dioptric optic [refracting lens]. The light was visible from eight miles out at sea. It was built by John B. Porter of Yarmouth County for $2,248.00. This lighthouse was lit on Feb. 1, 1893. The first keeper, Benjamin LeBlanc, was paid $300 per year. By 1906 there was a hand foghorn to answer signals from approaching vessels. The next keeper, Norman Couttreau was given the job of lightkeeper by the government after he fought in WW I. He was on the Candlebox from that time until sometime in the 1940's. Norman's son, Vernon Couttreau, was born on the island in 1921, then his daughter Lois (Couttreau) Nickerson was born there in 1924. Norman's five other children were not born on the Candlebox because they were due in the winter time. It was too hard to have them on the island because of the unpredictable weather. 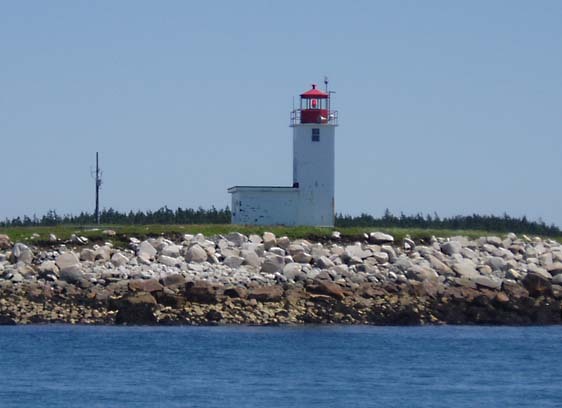 Lois thinks that her father was trained by Benjamin LeBlanc and that he, in turn, may have trained Delbert Surrette to take over his position as the lightkeeper after 1940. Keeper Lester LeBlanc, who took over from Delbert Surrette, was the first and only one to live in the south side of the new dwelling house. Light Height: 056ft feet above water level.